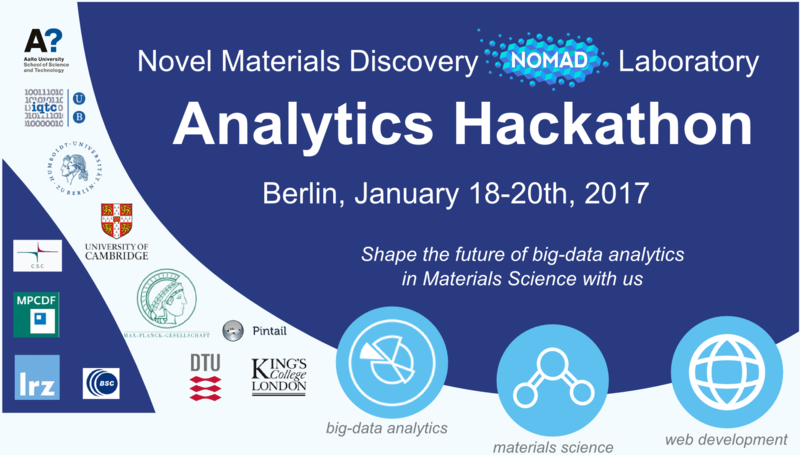 The aim of the hackathon is to build new big-data analytics and web-based tools for the NOMAD project. Are you an outstanding programmer who wants to show your skills to world-leading companies and research institutions? Then apply to join us! You can send your CV and (optionally) a sample of code you have written to Angelo Ziletti (ziletti@fhi-berlin.mpg.de) before 15 Jan 2017. We'll make our selections by 16 Jan 2017. If you are selected, we will pay for your accommodation and contribute to your travel expenses. Food and drink will also be provided.